As with all campus buildings, architects have designed the facility to blend in with the natural landscape and carefully site the building around groves of trees as to minimize the number of trees removed for the building and accompanying driveways. 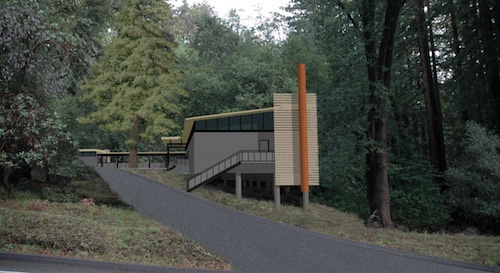 In the next few weeks, UC Santa Cruz will start construction on a building to process and temporarily hold waste generated by teaching, research, and campus maintenance activities. The nearly $20 million Environmental Health and Safety Facility—funded by the state through the UC Office of the President—will help ensure the campus continues to comply with state and federal regulations. The 7,300-square-foot building will be built adjacent to Heller Road, just south of the Kerr Hall pedestrian bridge. Construction on the facility is expected to start in November and end in December 2018. Like all campus buildings, architects have designed the facility to blend in with the natural landscape and carefully site the building around groves of trees so as to minimize the number of trees removed for the building and accompanying driveways. UC Santa Cruz has instructors and researchers in the life sciences, physical sciences, and fine arts who use chemicals in their work and generate waste that needs processing and disposal. In addition, chemicals are used to help maintain the campus. Chemical waste is packaged and labeled by trained researchers and staff, and is collected once a week to bring it to the holding facility. Within 90 days, a licensed contractor transports the chemical waste to an approved and permitted treatment, storage, and disposal facility.